This is not really a book, it's a 34-page pamphlet. The first half is a cursory history of the enlarger as it developed over the years, beginning around 1880 with a big horizontal job, with special emphasis on the drawbacks and limitations of design. The second half introduces the Beseler 45-series of enlargers, and explains in detail why the new Beselers correct all these problems and take a fresh, new approach to design and implementation. It's a fun little book; not particularly informative, but an interesting read nonetheless. 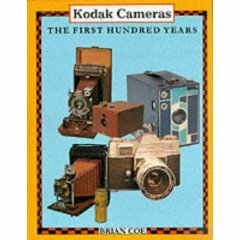 Eastman Kodak made a lot of cameras in its long history, and I'm amazed at how well Brian Coe documented them. He broke the book into nine major sections: Kodak Box (and solid), Brownie Box, Kodak folders, Brownie folders, 35mm, Cartridge cameras (126, 110 and disc), Instant, Plate cameras, and "Specials and Curiosities." 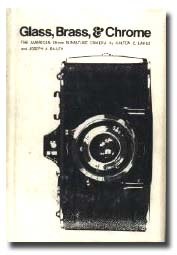 A lot of collector's books are like Blue Book catalogs; just a list of cameras, specs, and prices. The problem with Blue Books is that they give you just enough info to identify a camera and figure out it's present market value, which means they go obsolete very quickly. This is similar to a catalog in that it lists cameras with a photo and a short list of specs and the original selling price, but omits the present market price, so it doesn't get so dated. That and the fact that they have a photo of each camera makes identification much easier. There's also some verbiage introducing each section, a few of the cameras (like Kodak's 35mm Ektra) get special mentions, but mostly this is a collector's guide book. Not great for history, but wonderful if you want to know which model that Kodak really is, when it was made, and what they charged for it when it was new. Cons: Most cameras are only given a very short description, so if you want any real meat about your late Aunt Blabby's Brownie box camera, you probably won't get it here. This is probably the best book on camera collecting I've read, in terms of being interesting reading. Most books I've read tend to be catalogs of camera types, serial number runs, features, lens specs, and variants. They're very useful for researching a particular camera, but they're dull reading. They aren't meant to be read for pleasure, they're reference books. Glass, Brass & Chrome bridges the span between being a reference and a readable history. It has plenty of the "the C model had an f4.3 single-soft coated Angulon in a Crapex leaf shutter, with flash synchronization in about half the models" stuff. But it's also loaded with history, the whys and hows. They trace the development and the ups and downs of the famous Argus C3, the engine that drove Univex, the undoing of Bolsey. This isn't just about fine (or crude) hunks of metal and bakelite, it's about people, dreams, and a little marketing. 35mm started out as movie film, but was quickly adapted to still-camera use. The book is about the American camera industry during 35mm's rise to dominance, from it's beginning in Germany with the Leica and Contax, to its domestic introduction with the hugely successful Argus A- and C- series, Universal's ultra-cheap cameras, Kodak's wide range of hits and misses, through the noble but regrettably flawed Kardons, Claruses, and Fotons. It's fascinating stuff, and it happens to trace the zenith-to-nadir of the American camera industry (as manufacturers) at the same time. The only real flaw with the book, to my eye, is its age. It was published in 1972, which meant it was written in the late 60s. For the American camera portion it's a fitting end. But for the final chapter on 35mm it lacks the benefit of foresight. The authors leave the 35mm format firmly under assault by the market dominance of 126 Instamatic cartridges, and they believe (and rightly so) that 35mm was probably doomed. They had no way of seeing that 126 simply was never embraced by the camera makers who made pro-grade equipment. They could not forsee the introduction of 110 which would take over the 126 market, then destroy it by its own marginal qualities. They did not forsee the 35mm SLR boom in the late 70s as the Japanese introduced electronic marvels like the Canon AE-1 that were easier to use, high quality, and far more affordable than their predecessors. They could not forsee the auto-exposure, auto-focus 35mm SLRs and non-SLRs that would eat away at the top of the 110 field, nor the failure of Kodak's disc system, nor the ultimate boom of disposables that took the low-end of the market—all of which took 35mm film. Small quibble, and ultimately it doesn't detract from the value of this book at all. If you own or love an American 35mm camera of almost any type, or if you're simply interested in a neglected area of photographic history, this is a must-read book. Pros: Great information on a segment of photographic history. There are two (that I am aware of) good camera blue-books. 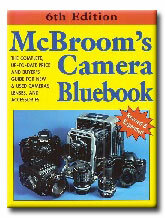 One is McKeown's Price Guide to Antique and Classic Cameras, which is expensive as hell ($87.50 in paperback), and the much more reasonably priced McBroom's Camera Bluebook ($25 in paper). Michael McBroom's excellent book covers new and recently used cameras (depending on the make, but figure it begins with the Japanese invasion of the 60's). It features mainly the good stuff—SLRs or quality rangefinders from the top makers (Canon, Minolta, Nikon, Olympus, Pentax, Leica, etc), medium and large format, and some accessories. The text discusses a camera's merits and it's place in history as well, so you get a nice sense of the evolution of a product line, rather than just the specifications of a hunk of metal (and plastic). McBroom is also very good at pointing out the minor differences in various camera variants and lenses—the sort of thing that is invaluable to a buyer. I'm a Canon fan, and there are times I would like to pound their marketing people for some of their naming shenanigans (the Canon F-1, F-1n and "New" F-1 a case in point). There is also pricing information, which is of less value than the descriptions, in my opinion. Pricing is convenient but the internet makes price research for most equipment pretty easy. 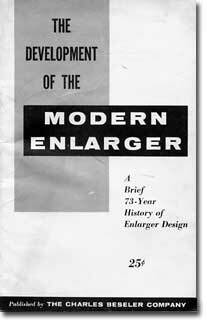 But if you're looking at something on eBay and you want to know what it is, this book becomes invaluable. McBroom's is not encyclopedic and there is plenty left out—don't buy the book sight-unseen. But I think most camera collectors or enthusiasts who buy used equipment will eagerly find shelf-space for this book. Ther'es always room in my library for the next edition. Pros: Great information—more than just a few specs and a price tag. Cons: Won't have your Great-Uncle Oscar's Voigtänder Prominent listed.